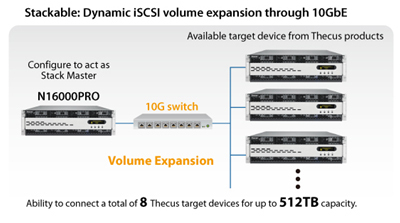 The new PRO series of 12 and 16-bay NAS comes with the fastest Intel® technology ever seen at Thecus®. The N16000PRO and the N12000PRO are equipped with the Xeon® E3-1275 processor that runs at 3.4 GHz. The quad-core processors are matched by8GB of DDR3 RAM on both devices to make sure that the biggest commands fly through without an itch. 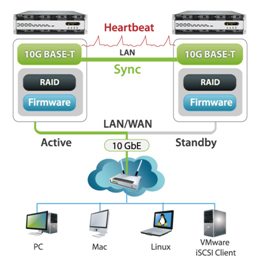 And to make sure the full power of the processors is used, a 10GbE network card can be added to the available PCI-e slot and link aggregation can be used to make sure your network doesn’t slow you down. Daisy-chaining is the most innovative function to expand storage volume while keeping cost down. Up to four D16000 DAS can be added to your N16000PRO and N12000PRO for an additional 64 bays of storage. As a result, IT enterprises or consumers who utilize large amounts of storage can obtain massive expansion and save cost. Another perk about daisy-chaining is that transfer speeds are fast! Thanks to the SAS cables that are put-to-use to daisy-chain the DAS to the NAS. 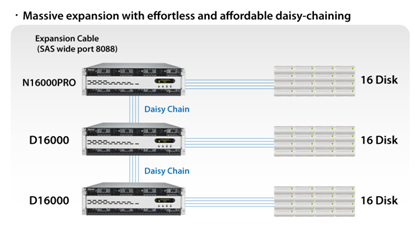 If paired with volume expansion, daisy-chain can help large businesses expand their storage capacity to up to2.5 PB!